Business owners who simply want to “set it and forget it” will likely enjoy earning unlimited 1.5 percent cash back with the new Chase Ink Business Unlimited card. Apparently, after the roaring success of the Chase Freedom Unlimited card, Chase spied a gap in its business portfolio and has moved to replicate the Freedom Unlimited card’s success for its business line of credit cards. The new Chase Ink Business Unlimited card mirrors the simplicity of the Freedom Unlimited card: Business owners earn unlimited 1.5-percent cash back on all their purchases (and their employees’ purchases), with no spending caps, bonus categories or annual fees to fret about. Also, Ultimate Rewards members listen up: If you haven’t already hit your application limit with Chase’s 5/24 rule, the Ink Business Unlimited card presents yet another opportunity to score 50,000 Ultimate Rewards points in one swoop. The Chase Ink Business Unlimited card offers a $500 sign-up bonus to new cardholders who manage to spend $3,000 in the first three months of membership. This is an incredibly large sign-up bonus for a cash back card, not to mention a very reasonable spending requirement. Best of all, since the Ink Business Unlimited card is part of the Ultimate Rewards family, the bonus translates to 50,000 Ultimate Rewards points. If you are in the game of collecting Ultimate Rewards points (or are looking to get into the game), this is a great opportunity to score a large number of points toward your next free plane ticket. Business owners who prefer a no-annual-fee card without spending caps or bonus categories to keep track of, will earn a high rate of 1.5-percent cash back on every purchase with the Ink Business Unlimited card. Note that, while this is a pretty good rewards rate for a no-fee card, you can earn more cash back for your business if you’re willing to dole out a little extra each year for a card with an annual fee. For instance, the Capital One Spark Cash card offers unlimited 2 percent cash back on every purchase for a $95 annual fee (and no fee for employee cards). For many business owners, it should be easy to rack up enough cash back on business purchases to quickly outmatch a $95 fee. Furthermore, if you’re not fazed by some extra maintenance and you want to maximize the rewards on your business purchases, you should seriously consider signing up for a travel rewards card – particularly a card with category bonuses. 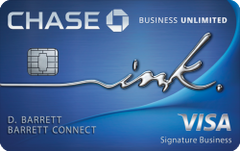 The Chase Ink Business Preferred card, for instance, offers 3 points per dollar on up to $150,000 in business-related purchases each year – twice the rate of the Ink Business Unlimited card. On the plus side, Chase makes it relatively simple to redeem your cash back. Points don’t expire and you have a variety of options for redeeming your rewards – you can redeem your points for a statement credit or as a deposit into a checking or savings account, or you can redeem them for a variety of other rewards, including travel rewards, gift cards, Amazon purchases and experiences. Unfortunately, for cardholders seeking the ultimate low-maintenance credit card, Chase falls a little short of some of its competitors – there’s no option to automatically redeem your cash back (the Capital One Spark Cash Select card offers this feature), and you have to wait until you collect at least 2,000 points to redeem them. The Chase Ink Business Unlimited card isn’t just for low-maintenance cardholders. It’s also a great card for rewards maximizers – you can pair the card with a premium Ultimate Rewards card – such as the Chase Sapphire Preferred Card, which offers 2 points per dollar on travel and restaurant purchases, or the Chase Ink Business Preferred card, which offers a 3-point bonus on business purchases. Not only can you juggle the Chase Ink Business Unlimited card with these cards to earn a 1.5-percent bonus on purchases that don’t qualify for the other cards’ bonus categories, but you can then transfer your points to the Sapphire Preferred card or the Ink Business Preferred card and redeem them for travel to earn a 25-percent redemption bonus on your points (basically boosting their value to 1.25 cents per point). You can also transfer your points from these cards to a number of airline loyalty programs, such as United or Southwest airlines, to get an even better value on your points. Aside from cash back rewards, the Chase Ink Business Unlimited card has another very appealing feature for business owners: It offers a 0-percent introductory APR on new purchases for 12 months – a very long introductory period for a business card (after that, the ongoing rate is 15.49 to 21.49 percent). If you are looking to make a large purchase for your business, this could be a great opportunity to finance it at 0-percent for a year, while using your sign-up bonus to help pay down the purchase. The Chase Ink Business Unlimited card is designed specifically for the need of small-business owners: Chase allows you to add employees to your account for no annual fee and to set individual limits for each employee. You can also use Chase’s mobile app to set up alerts for your employee cards, as well as to file and track receipts on the go. Why get the Chase Ink Business Unlimited card? You want a simple, no-annual-fee business credit card that lets you and your employees earn a high rate of cash back. You want the ability to issue credit cards to your employees for no additional fee and closely monitor their spending. You’re looking for an additional opportunity to earn 50,000 Ultimate Rewards points. You’re searching for a card to pair with the Chase Ink Business Preferred card. Spend at least $3,000 on the card in the first three months to earn the $500 sign-up bonus. Use the card for all your purchases (and your employees’ purchases) to earn a consistently high rate of cash back. Pair this card with a premium Ultimate Rewards card, such as the Chase Sapphire Preferred card or the Chase Ink Business Preferred card – you can transfer your points to those cards and redeem them for travel to get a 25-percent boost on your point value.